Mike Peter took home several top TK Angus bulls at the TK Angus 31st Annual sale. 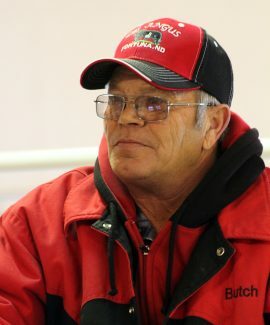 Butch Sorenson, LBS Ranch, Fortuna, North Dakota, many years repeat TK Angus bull buyer. The Marlatt Families, Tim and Kim along with son Rick and his wife Jenn held the 31st Annual TK Angus sale at the ranch just east of Valetine, Nebraska. The bulls offered in the December sale were the older of the spring 2017 and fall 2016 born bulls. This group of bulls were younger and specifically held back for the spring sale. The high selling bull was lot 11, TK Prosperity D312, a 9/16 son of TK Prosperity Z429 with 205 day wt. of 781 pounds, yearling wt of 1,347 pounds and epds of CED 3 BW 3.4 WW 75 YW 129 Milk 26 $B 166.95. Greg Siegel, Nebraska was the buyer at $9,750. Lot 75, TK Renown E139, a 2/17 son of SAV Renown 3439 that has weaning wt. of 784 pounds, yearling wt. of 1325 pounds and epds of CED -2 BW 3.6 WW 72 YW 127 Milk 23 $B 136.29 sold to Mike Peter, Nebraska for $9,000. Mike Peter also got lot 77, another 2/17 Renown son with epds of CED 2 BW 3.4 WW 56 YW 105 Milk 27 for $8,500. Lot 5, TK Prosperity D373, a 9/16 son of TK Prosperity D350 sold to to Joe Giles, Nebraska for $7,750. Also at $7750 was lot 83, TK Platinum E51, a 2/17 son of SAV Platinum 0010 selling to Ron Iossi, Nebraska. Lot 73, TK Renown E142, a 1/17 son of SAV Renown sold to Mike Peter for $7,500. 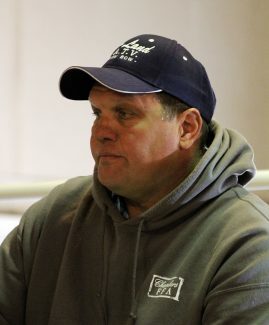 On the female side Jeff Penz, Oklahoma, purchased the pick of the entire fall bred heifers for $8,750. There was another spring snow event the day previous to the sale with snow and ice covering the Valentine area. The crowd was not as big as normal, so Tim and Rick have some bulls for sale by private treaty.